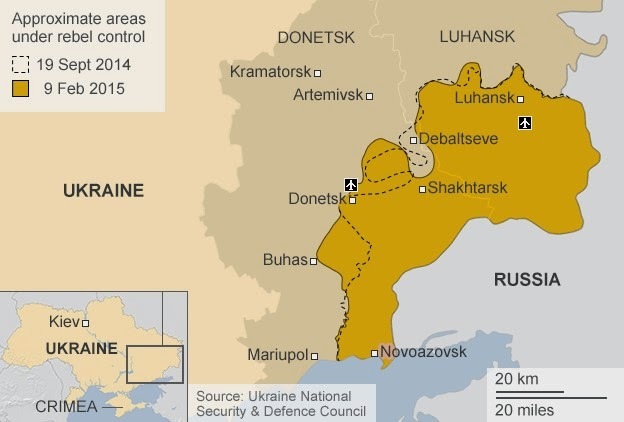 The map of the current Ukrainan situation tells an interesting story. Why a 2-day delay before the ceasefire comes into effect ? That salient at Debaltseve looks awfully vulnerable: if the eyes of the world weren't quite so fixed on the area, Russia would bite that off in an afternoon and they may yet do so anyway. Retention at least of Mariupol will be a boon for Ukraine, in the circumstances. What has Russia gained? In material terms, I'm not sure. Raedwald suggests "the industry and the wealth producing bits, whilst Kiev has the beet fields and the pensioners" and if that's true, it's more than just a bit of swagger and nose-thumbing on Putin's part. But I've also read that the Crimea and these eastern parts are going to cost him a lot of hard currency to keep them happy. So it's a rather costly macho gesture ? Or (as some say) a price well worth paying to fend off an existential threat ? - at least, as perceived in the Kremlin. The latter seems an extreme assessment. All in all, I'm inclined to think it's a rather unusual (for the 21st C) example of best-form-of-defence-is-attack. The lazy neocon strategy of baiting Russia along its borders, not to mention the expansionism of the EU (and NATO), provides plenty of motive for Putin to flex his BM 21s. He has followed Soviet doctrine pretty much to the letter (albeit on pinprick scale), as I confidently predicted here. There's also an element of making the best of a bad job, as the Ukrainian separatists are probably not 100% under control - or at least, they weren't when this whole thing seriosuly kicked off. A bit like China and N.Korea (again, on a tiny scale): why do the Chinese indulge the childish bastards ? - well, they are their childish bastards, so piss off the rest of you. Maybe now Putin can get back to the serious business of managing an economy around $50 oil, which he very much needs to do. There is one good aspect to this. It will be ten times harder for Russia to play its 'little green men' trick again in (say) the Baltic - tactically, that is, not logistically - because we've seen it now. And perhaps the Typhoons weren't such a bad investment after all; so long as we keep up the NATO spending now. But with the Greek thing simmering away, that might be another story. Do you seriously believe Russian care to dabble in the Baltic states at the moment especially as they are NATO members? More likely this story is Baltics - NATO lead meme to argue for more funds / troops / weapons / power etc. "Why a 2-day delay before the ceasefire comes into effect"
On R4 news today a journalist said some of the rebel fighters he spoke to hadn't heard about the ceasefire agreement. I imagine it might take 2 days to be sure all the small units are told exactly what to do. I do agree with hovis that all this talk about Baltic invasion is our side talking up military spending. I think the most interesting thing about Ukraine is how the neocon-influence are going to fund the propping up of the Ukraine economy. Bang on they are trying to take this 'pocket' today. It looks a little like the Kursk Salient after all! "The lazy neocon strategy of baiting Russia along its borders ... the expansionism of the EU (and NATO)": every time some nitwit compares Putin to Hitler, I begin to wonder whether it's been our side that's been the Nazis here. We really didn't 275 of them to take down the Tu95s. Still would have been far far cheaper and much more efficient to have bought US surplus. ND> "a cheap strategy (for someone living in the USA)"
"The immediate need is for $15 billion. But to ensure Ukraine’s survival and encourage private investment, Western powers need to make a political commitment to provide additional sums ... If ... Europe is generous with its financial assistance, a stable and prosperous Ukraine will provide an example that makes clear that the blame for Russia’s financial troubles lies with Mr. Putin." See also this NYT article: "more than $40 billion financing gap that experts say the country faces over the next four years. And that does not include money to rebuild or replace Ukraine’s dilapidated mines and obsolete industries once sustained by contracts with Russia"
Sounds an expensive game plan for someone. Since the money will simply be conjured out of thin air it will only be expensive for us little people. Mr Soros et al, getting first dibs on it, will enjoy its spending power to the very fullest. Partition. Protects Russia's pipelines (to Europe N.B.) and ethnic Russian/Russian-speaking Ukrainians. If South Sudan can do it, so can Eastern Ukraine. a) Russia should be open to looting by all of his friends, as was the case up to the late 90s, rather than only a few of them who keep onside with Putin. b) a few million more poor Ukranians would do wonders for any potential upward wage pressures in the Western end of the EU. c) to this end no (tax or oligarch-funded) expense will be spared in the effort to first bring Ukraine into the EU, then destroy Russia aka "create an open society". It therefore behoves those of us who are neither Davos men, poor Ukranians, or millionaires, to resist these tendencies as best we may. Breather and regrouping, Nick, plus the bottleneck Ukraine troops are in. That rebel controlled area looks remarkably like Grandpa Simpson having a kip.